Don’t let this dive site’s proximity to the shore fool you. 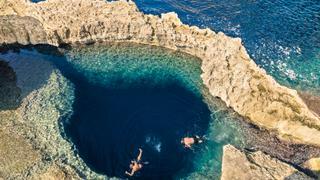 Not only does this spot blow stereotypes about Med diving out of the water, it also offers two stunning sites in one descent. The natural rock formations of the Blue Hole grotto and the limestone lagoon of the Inland Sea are linked by a beautiful series of small caves and caverns, allowing divers to explore both. One of the best shipwreck dives, the site has also attracted a good deal of sea life, a bonus for Med dives, and over the years fishing nets have attached to the wreck, creating an ethereal scene as divers descend. “At 25 to 30 metres you start to see the boat, and it’s quite spooky with the nets floating off,” says Giblin. There’s also a good chance you’ll be able to enjoy the dive in complete solitude. 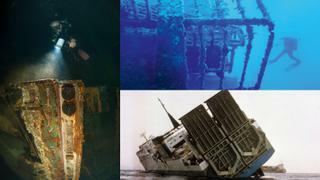 “There’s an American bomber that sank off Calvi in Corsica, but everyone knows about that. This is very much a little-known secret,” he adds. 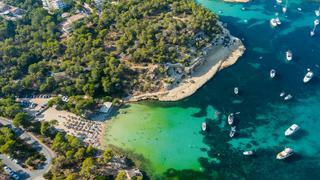 Mallorca is renowned for its on-land pursuits, including cycling, golf and hiking. 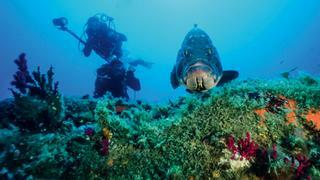 But the belle of the Balearics also has eight marine protected areas and one marine national park. “The sites are some of the healthiest and most exciting marine ecosystems in the Mediterranean,” says Brad Robertson, founder of Ondine Diving. The dive starts with a descent along the starboard hull, taking in the immense size of this vessel before dropping down to a depth of 12 metres, ideal for beginners. 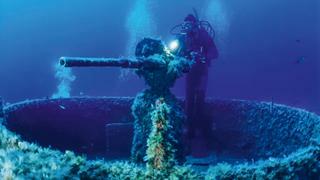 More advanced divers can slip inside the wreck, exploring the accommodation blocks and various decks – perhaps swimming into the bridge and engine room. Boasting some of the clearest water in the Mediterranean, Corsica is a diver’s heaven, dotted with wrecks, caves, grottoes and reefs. Kirsten Schoombie, the dive instructor on 55 metre AmelsAstra, has dived all over the world, from South East Asia to the Galápagos, and she names Corsica as one of the most exceptional places to dive in the summer. What the petite island of Lavezzi lacks in inhabitants it makes up for in an abundance of scuba spots, with more than 40 dive sites. Lying at the southern tip of the island, the dives in the Lavezzi Marine Reserve stand out for their unusual rock formations, which create a maze of underwater caverns and canyons, towering peaks and sloping valleys with granite boulders. The aptly named Grouper City is a highlight, with excellent visibility in 15 to 30 metres of water and a population of giant grouper. Just a mile from the eastern side of Lavezzi, divers descend along the designated mooring chain as it’s a high current site. Settle at 30 metres and wait to be greeted by grouper and moray eels that hide in the giant rock formations.